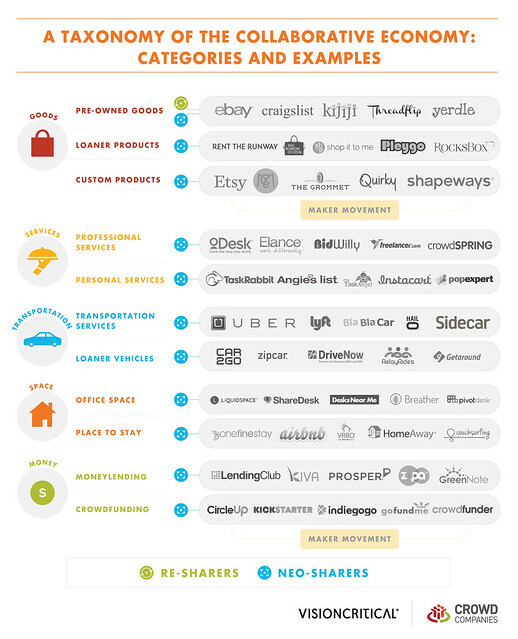 A Taxonomy Of The Collaborative Economy –And What Brands Are Doing About It. Confused about how crowdfunding, maker movement and sharing fit into the larger Collaborative Economy? This diagram brings all of these trends together into one so you can see how the crowd is getting what they need from each other – rather than buying from traditional corporations. Find out why more than 40,000 people have viewed the full report “Sharing is the new buying” for the complete study. Above Graphic: This image distills this large movement of over 9000 startups into a single diagram by five families, eleven classes, and a sample of district startups. Working from left to right on the chart, there are five distinct families, categorized by goods, services, space, transportation, and money. People created, funded, or shared across these major families. For the most part, this accordantly represents the physical world. It’s assumed each of these five families are dependent on the first phase, social media. Eleven unique classes breakdown into more specific use cases. The second column indicates specific use cases of company types in this vast market. For example, within services, we broke out professional services and personal services, as we see two distinct phyla of company types. Next, thousands of individual species have emerged. Respected authority, Lisa Gansky is tracking a whopping 9000+ startups in this space around the globe. The startups we selected are just examples, ones that we felt would best be understood by the audience, but certainly cannot represent the full scope of the thousands in existence. 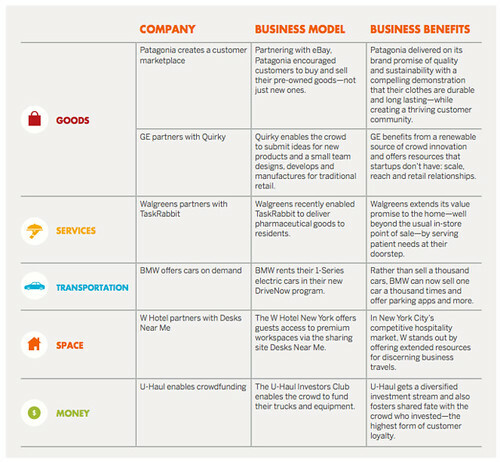 To tie this back into how businesses can participate in this new economy, we’ve also created this matrix that features six examples: Patagonia, GE, Walgreens, BMW, W Hotels, and U-Haul. This is only a sample of six instances of companies. Our larger Timeline of the Collaborative Economy shows 80 distinct examples. This fast moving space is difficult to document. I’ll be the first disclaim this taxonomy will be valid for a short period of time only. New services, startups and technologies are emerging at a fast pace. Other industry experts have also tried to categorize this market. For example, the crowd has quickly funded their own 3D printer at a low price, showing the zero marginal cost economy coming to life. Furthermore, this taxonomy, while a strong overview, doesn’t include the heavily-discussed Bitcoin or other crypto-currencies. I’m being briefed on new and unique business models on a weekly basis. For example, Upshift cars is a new business model that can enable a co-ownership of a fleet of cars, something new that doesn’t quite cleanly fit into the other categories listed.